Thao Lam is a Toronto-based illustrator and art buyer who studied illustration at Sheridan College. She is passionate about children’s books and is very interested in visual storytelling. 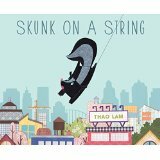 Skunk on a String, her first solo book, is a story-without-words told with cut paper collage illustrations. 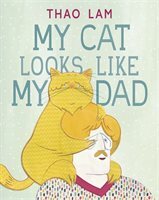 Minimal text paired with bright paper-collage illustrations create comparisons on each spread in which the narrator talks about their family. A surprising twist at the end reveals the narrator’s unexpected identity, also hinted at with clues in the art. 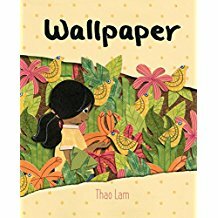 It’s a playful, warm and whimsical story about the love that makes a family a unit, no matter how unusual it may look from the outside. In Skunk on a String, we meet a skunk who has been tied to the tail of a balloon. Try as he might, the persistent critter can’t get anyone to untie him. In this wordless story, he is shooed and swatted through a bustling parade, past the windowpanes of the city’s apartment buildings with their diverse, busy inhabitants, then up to the construction cranes high above the city. He floats through the zoo, into traffic, under water, and eventually lands atop a Ferris wheel. When he finally unties himself, the skunk misses the aerial life — so he comes up with an inspired way to fly again.